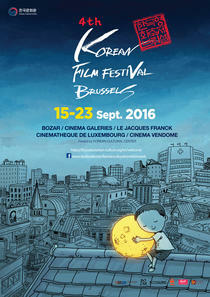 The dynamic “Korean Cultural Center”, before to open his nice office in Brussels, created the “Korean Film Festival”, 4 years ago, already! “Namless Gangters: Rules of the Time”(Yun Jong-bin/2012/133″), this Friday Sept. 23d., at 9.30 p.m., to close the “Korean Film Festival”. Also, being part of this Festival we are invited, on Tuesday Sept. 20, at 8 p.m., in the “Korean Cultural Center”, for a Korean music concert, gived by “Kim Sawoll & Kim Haewon”, followed by the Festival’s Reception. During the Opening Evening, 8 people were ask to come on stage, in front of the screen, each one of them receiving a gift for their regular attendance, in this Cutural Centre, at the “Korean Film Fridays”. So, all of us we are invited, each friday, to watch there one Korean film (take a look on http://www.brussels.korean-culture.org). … And if you walk by the “Sablon Square” and that you like comic books, this same “Korean Cultural Center” organize, till October 22d., one temporary exhibition called “3d. Belgian Korean Comics Exhibition” (take a look on www. brussels . korean-culture.org), being opened from Monday till Saturday, from 09 a.m. till 05 p.m. The entrance is free of charge.